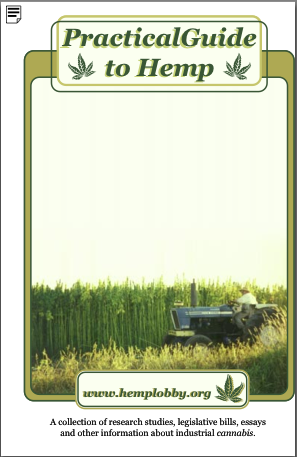 In an effort to educate policy-makers, researchers and agriculturalists, Hemplobby created a booklet called “Practical Guide to Cannabis.” Within are excerpts from many research studies, legislative bills, growing guides and various discourse on hemp policy. Download Practical Guide to Cannabis in Adobe Acrobat .pdf format for convenient on-screen viewing or printing. We encourage you to distribute this booklet electronically, please link directly to the document or this site rather than storing on an external server. Created by Dave Olson and Ed Saukkooja, designed by David White and cover photo by Eve Lentz.